A catalyst is a substance that is used to accelerate the rate of a chemical reaction, and by using an industrial-grade catalyst bed in the air treatment equipment, oxidation is accomplished at a much lower temperature compared to thermal oxidation. When a catalytic oxidizer is used, an air pollutant is mixed with oxygen, which is then heated to an elevated temperature and passed through a catalyst. This method destroys the pollutant in the air stream by converting it to CO2 , H2O and heat. The rate of reaction is controlled by the temperature of the catalyst chamber and the length of time the pollutant spends within the catalyst itself. Catalytic oxidation typically happens through a chemical reaction between the VOC molecules and a metal or ceramic catalyst bed in the oxidizer system. 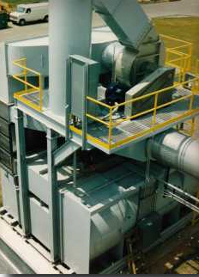 This system can operate effectively and efficiently from 370 to 480 degrees Celsius (oC), whereas a thermal oxidizer requires temperatures nearly double that between 700oC to 820oC. This can result in a major fuel from 40% to 60%, further reducing both the carbon emissions and operating costs when compared to a thermal oxidizer.